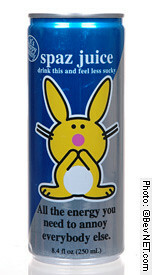 "Happy Bunny Spaz Juice is certainly the cutest drink of 2004. The drink features a yellow bunny rabbit and the sayings, 'drink this and feel less sucky' and 'All the energy you need to annoy everyone else'. Popular among girls and young women, the nearly ubiquitous Happy Bunny brand can be found on everything from apparel to stickers. The brand features the trademarked Happy Bunny who, despite her cute appearance, is known for saying rather mean things. Spaz Juice has a great blue raspberry flavor and the package is adorable. We're not sure if teenage girls really need the extra energy, but with so many brands targeted toward the young male demographic, it is refreshing to see one address young women. This product might have particular success selling in retail locations and other places where the Happy Bunny brand can be found. Overall, Spaz Juice is a very well-done and well-positioned energy drink with definite commercial potential."